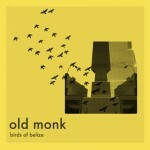 Recorded in Brooklyn at Seaside Lounge, Birds of Belize is a hectic and energetic debut. The album skillfully strides the line between experimental psych licks and catchy pop hooks. Fuzzed out guitars and hyper-frenetic drumming showcase the band’s love for progressive rock, while the melodic vocals and creative bass riffs display Old Monk’s artful dedication to classic pop and garage rock. Lyrically, the album ventures through a wide array of moods from the sincere and historic, to the curiously polite, or to the utterly absurd and facetious. The band expertly blends this in with pop culture references such as playful jabs at the Williamsburg music scene, and oddball tributes to Cassius Clay, David Bowie, and Thomas Pynchon. From the opening dance-punk intro of “Sacred Birds” to the furiously head-banging closing of “Skullsplitter”, Birds of Belize wastes no time in delivering pure, dynamic, and captivating rock and roll. Stay tuned this week for more information, and free previews!